Ages 10 through 17. Challenge your students to define words, compare word meanings, name synonyms and antonyms, etc. with the activities in this exciting language game. The activities motivate students to use precise vocabulary as they talk about words, sentences, and what they mean. All activities are presented at two levels of difficulty. The game can be used with students who have language disorders, students learning English as a second language, or students who need vocabulary enrichment activities. The kit includes game cards, a spinner, playing pieces and a large hard-back playing board. Word Definitions - Students are presented with a definition and with a group of words. Students must select the word that is being defined. Multiple Meanings - A definition is given for a word that can have more than one meaning. Students are then asked to review three sentences and to select the sentence in which the definition is used. Homophones - When presented with homophones, students must identify sentences in which the words are used correctly. Synonyms - When presented with a group of words, students must select the word that has the same meaning as the underlined word in a sentence. Antonyms - When presented with a group of words, students must identify the antonym for the underlined word in a sentence. Irregular Verbs - Students are asked to finish incomplete sentences by selecting the appropriate irregular verb forms. Prefixes - Students are asked to identify the correct definition for words containing prefixes. Word Definitions - Students are asked to demonstrate their understanding of word meanings by using specific words in a sentence about a specific topic. Antonyms - Students are asked to think of antonyms for words and to use these antonyms in sentences. Irregular Verbs - Students are asked to create sentences using irregular past tense verb forms. Prefix/Suffix - Students are asked to define words containing various prefixes and suffixes. The easier level features a multiple choice format. The "advanced" level require the student to generate a verbal response (e.g., creating sentences). 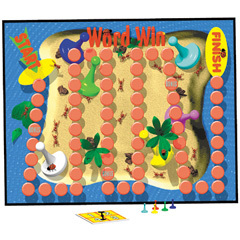 This game is an excellent resource for students with speech, language, and learning disabilities.